November sees the release of the autobiography of Barry Letts. The book covers the producer/director's career up to and throughout his time as producer of Doctor Who during Jon Pertwee's tenure as the Doctor, and features additional material that didn't appear in the previously released audio book version. The book will be published by Fantom Films, and will have both a paperback and limited edition hardback version with additional interviews with Letts, Terrance Dicks and Katy Manning. The company has also just released an audio book version of actress Mary Tamm's autobiography. Barry got his first taste of Doctor Who in 1967 when he directed the six-part serial The Enemy of the World. In 1969, he took over as the show’s producer. This was an exciting time for Doctor Who – the show had a new lead actor, and was being broadcast in colour for the first time. Barry reveals his memories of this era, talking about his relationship with script editor Terrance Dicks and the show’s cast, Jon Pertwee, Katy Manning and Roger Delgado. 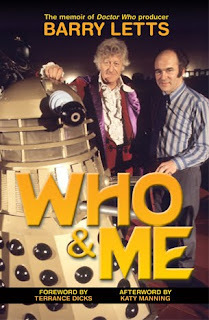 Packed with behind-the-scenes gossip, fascinating production detail and witty anecdotes, Who and Me recounts Barry Letts’ journey from struggling actor to successful producer, and the ups and downs of working on Doctor Who during the Jon Pertwee years.